THE TOP KEEPER PRO IS A PRECISION ENGINEERED MACHINE DESIGNED TO FIT ONTO MOST PETROL STRIMMERS. The Topkeeper Pro is designed for the maintenance of artificial grass and is very effective against moss, grass and broadleaved weeds. With the easy-to-assemble heading on the brush cutter, the Topkeeper Pro is very timesaving. 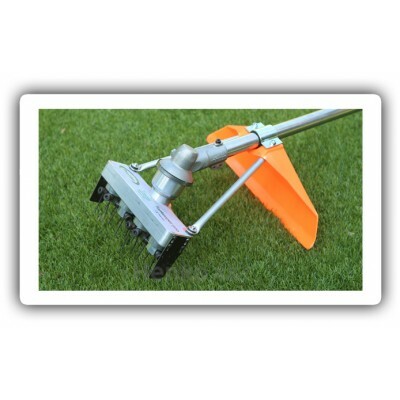 The heads of the device are adjusted to the correct height for cleaning artificial grass. it is not recommended at this time for use on needlepunched surfaces. ie Playrite matchwinner.